A dare gone terribly wrong. An SOS from another universe. A threat from right next door. Thirteen-year-old twin brothers Jayce and Val are about to jump the multi-verses on a dangerous dare, but true danger is closer to home than they realize. The Jupiter Prime colony has been orbiting the stormy gas giant for 19 years and all anyone wants is to get back to Earth. Sent to preserve the best and brightest of the population, a grievous error in the Prime's navigation coordinates sent the colony to an alternate dimension with no way to return to the Earth they call home. In a society where technical expertise is valued above all else, Jayce and Val are among the most privileged - until they uncover their uncle's plot to claim dominion over space and time. While attempting to rescue a lone girl from a post-apocalyptic earth, Val will come face to face with space pirates and Jayce will lay his life on the line for the sake of his brother and the little girl who holds the key to time itself. 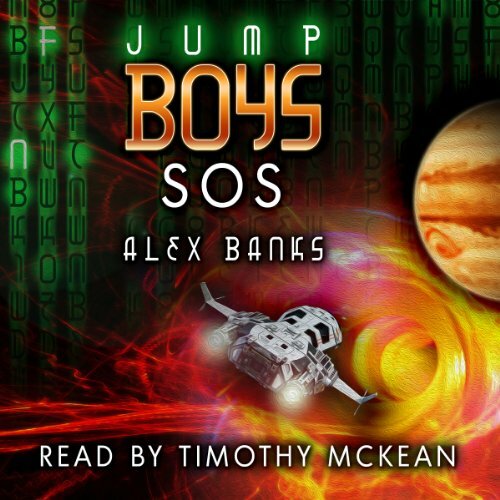 Would you consider the audio edition of Jump Boys to be better than the print version? I have always been a fan of audiobooks. You get to hear the emotion in the text rather than just read it. I think the action gets heightened and the suspense increased. I think this book would be a fun one to read as you listened along. What was one of the most memorable moments of Jump Boys? Throughout the book Jayce and Val are always focused on each others differences. There is a moment at the end of the book that shows them come together. It's powerful how they can see that, yes they are different, but together they can make great things happen. It just goes to show they complement each other. What about Timothy McKean’s performance did you like? I like the tone of his voice. He did well with narrating the story. This was an absolutely delight to read! I loved the distinct characterization between Jayce and Val. So many times we see twins in books as the same character with a different name but here the realistic differences really shine. I loved the way the dare of ‘the jump” leads to something far greater. The fun twists along the way only add to the cleverness of the book. I will be adding author Alex Banks to our list of family favorites. I didn't know what to expect from this book so I was pleasantly surprised when I listened to it. There is action, adventure with plenty of suspense. I wanted to find out what will happen next and if they would make the jump. I would recommend this book to all ages but especially to boys who might enjoy this more.